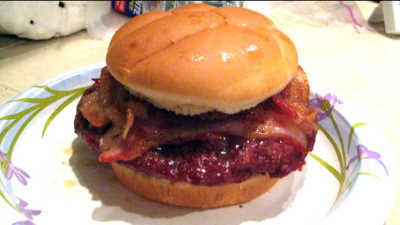 If you like a big juicy burger then this recipe is for you! They just don't get any better. I have had folks tell me these are the best! What puts this burger over the top is the mix of ground beef and maple sausage, A center filled with smoked Gouda and Canadian bacon give this burger additional layers of flavor. Mix the maple sausage and ground beef together thoroughly. In a medium mixing bowl combine 1 egg and 2 tbsp Worcestershire sauce. pour this over the meat and add about 2 tsp McCormick's Garlic & Onion Medley seasoning. Mix this into the meat good. Once the meat has been thoroughly mixed, form 8 patties 1" in diameter bigger then the diameter of the smoked Gouda cheese. Lay down the first patty. Lightly sprinkle on some McCormick's Mesquite seasoning. Now lay on 2 slices of Canadian bacon followed by a slice of smoked Gouda cheese. 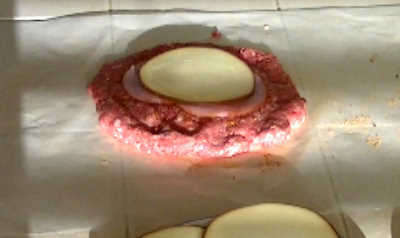 Lay a patty on top of the cheese and then press the edges forming a seal. You have now enclosed the Gouda cheese and Canadian bacon. Sprinkle on some of Myron Mixon's, Jack's Old South Hickory dry rub. This is one of may favorite rubs as it has great flavor that works on anything. Repeat the above steps making three more burgers. 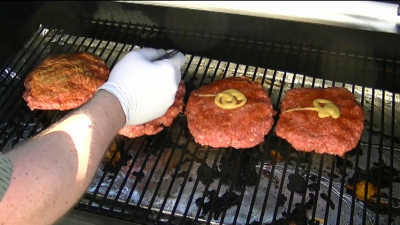 Once the burgers are formed, mop on some Jack Daniels honey Dijon mustard on the tops. 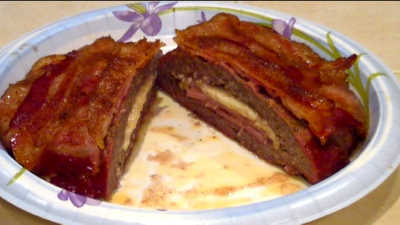 Next drape thin sliced bacon over the top covering it. Now dust it with Jack's Old South Hickory dry rub. Place them in a smoker pre-heated to 230 degrees. 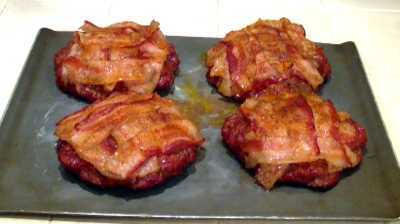 Smoke the burgers until the internal temperature reaches 170 degrees. 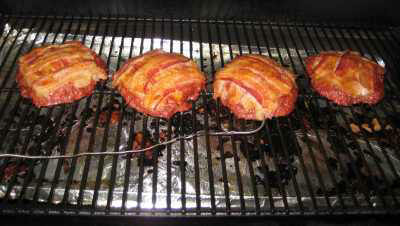 Some smokers may not brown the bacon enough for your liking. If this occurs just sit them under the broiler for 5 to 10 minutes. In my case my smoker does the trick with no additional steps. Sauce them up if you wish or have them naked. They are great either way! Serve them on a plate with or without a bun. I would be surprised if these burgers didn't do it for you.